We have had the wimpiest winter in Rochester, NY in anyone’s memory. Being the transplant that I am, I asked lifelong Rochesterians if they can remember a January where they could go outside with just a sweater. 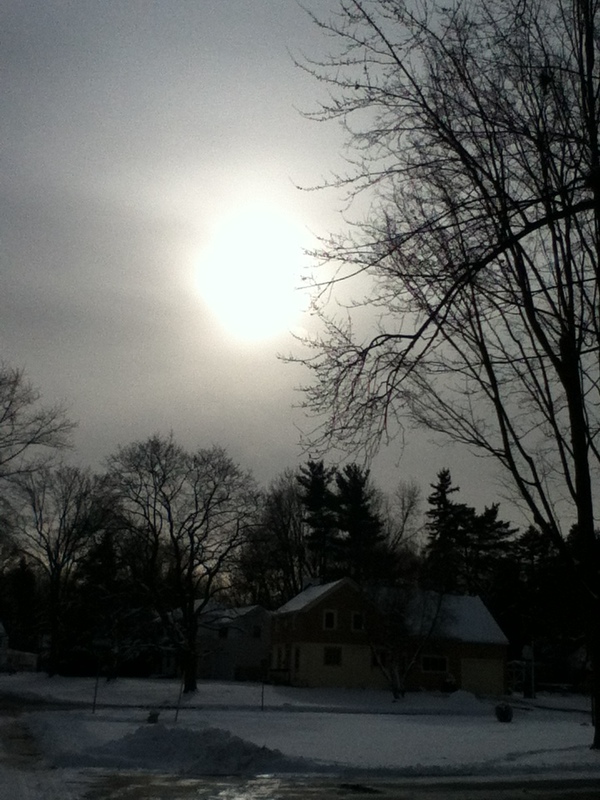 A January where the temperatures barely went below freezing. They can’t. But this warm winter seems no less longer then the cold snowy ones. It’s just dull. There are no bragging rights when you are stuck with a wimpy winter. There is no point to winter in Western New York if you can’t tell people elsewhere how you had to remove snow off your roof with a roof rake for fear of it caving in or have icicles hanging off the eaves of your house the height of a professional basketball player. we have not yet experienced any significant storms or accumulations. The official snowfall count for the season: 18.9 inches. 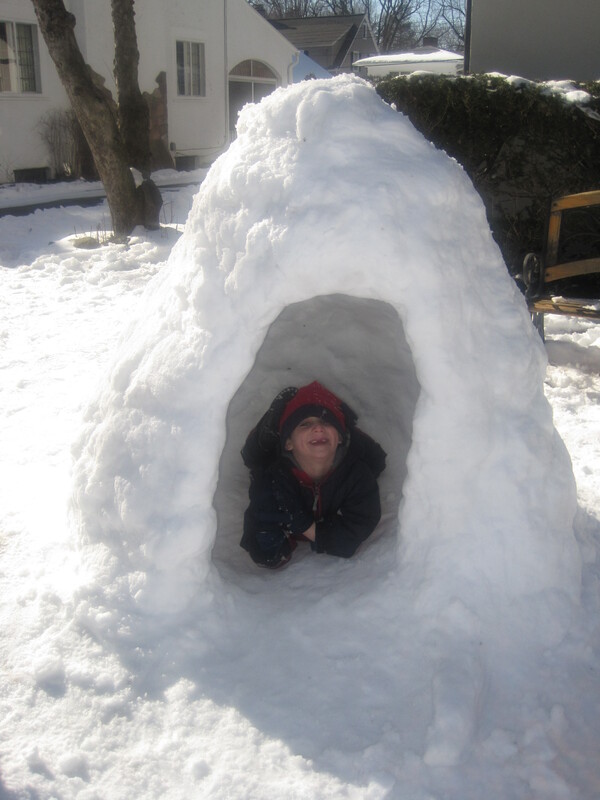 How much snow should have normally fallen by now? 55.7 inches. In years past, it was if we were living in a snow globe. It would snow a few inches every day for weeks at a time. Up on Lake Ontario, the Webster Ridge runner snowmobiling club has had to suspend its season because off lack of snow. My daughter’s youth group trip to go snow tubing was cancelled. My daughter also joined the high school cross country ski team this winter. At best, she has skied on the slushy man-made snow at Bristol Mountain. 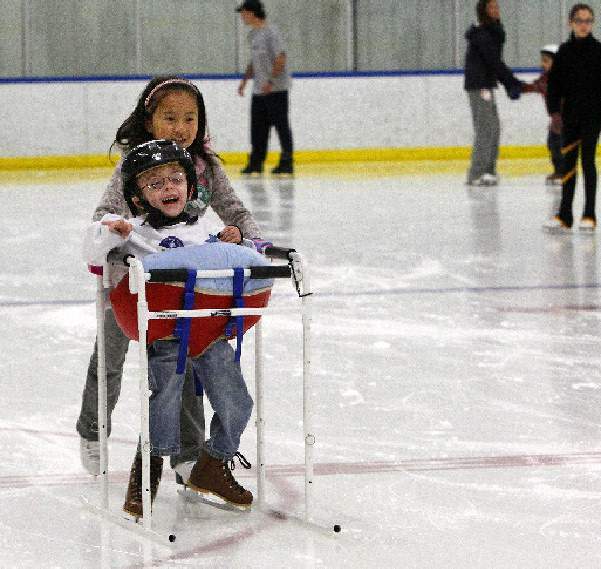 At worst, her team has spent the winter jogging outside or practicing on roller skis. Ironically, in one of the few strong winter systems that passed through, our school district cancelled all sport practices, including cross-country skiing. Imagine that, ski practice was cancelled on account of SNOW! But last night we were hit with several bands of fast moving lake-effect snow squalls. One particularly strong squall showed off its wintry moxy with a show of snow thunder and lightening that is completely out of place in the middle of winter. I love the land of Israel. I only wish that in this land, there could be more straight roads. It was about the sixth day of our tour of Israel. We had left sacred Jerusalem for a tour of the more secular, serene northern region of Israel, full of fields, mountains and seaside scenery. 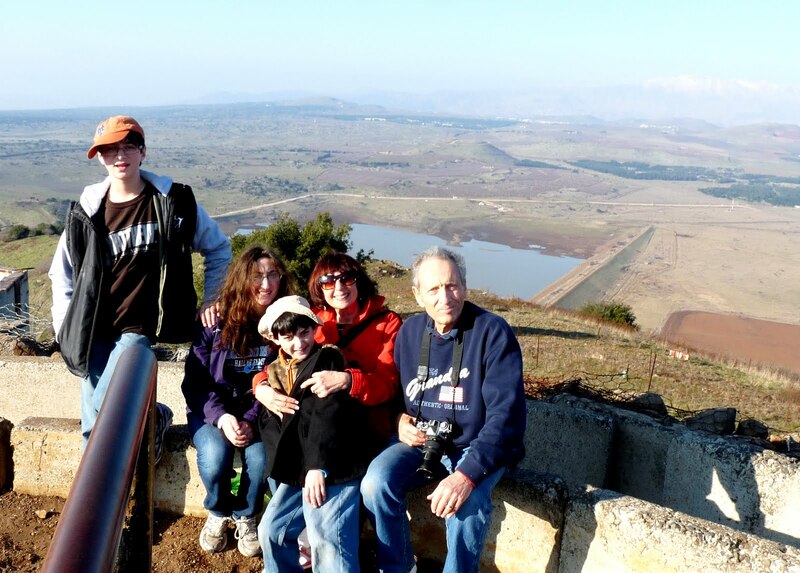 After a morning jeep ride, our family got back in our minibus and we began our long and winding climb climb climb to the top of Mount BenTal, one of the highest points of Israel. Here, there is a lookout point where Israelis fought the biggest tank battle against invading Syrian armies in the 1973 Yom Kippur War. In the Yom Kippur War of 1973, Mount Bental was the site of one of the largest tank battles in history. Mount Bental is a key strategic point for Israel due to its advantageous observation point. 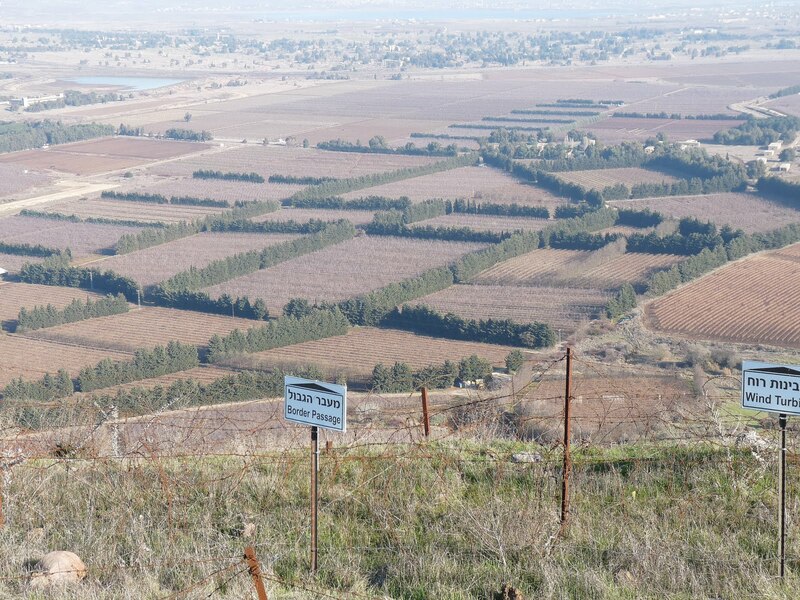 Israel knew it count not risk losing this mountain, nor any of the Golan Heights . 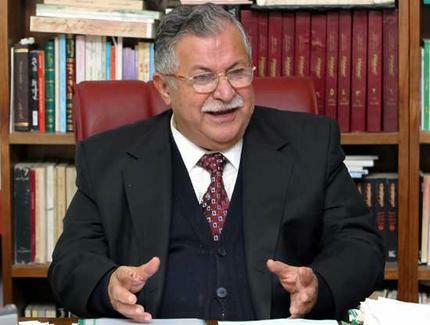 The Syrians attacked the Golan with 1,500 tanks and 1,000 artillery pieces. Israel countered with only 160 tanks and 60 artillery pieces. The long stretch of valley in between Mount Bental and Mount Hermon became known as the Valley of Tears. The 100 Israeli tanks were reduced to seven under extreme enemy fire. However, the Israelis managed to take down 600 Syrian tanks in the process. The Syrians eventually retreated, but not without inflicting heavy casualties on Israel. In the backdrop of all this very recent history, mount Bental is also a great place to have lunch. High atop on Mount Bental is Cafe Annan (anan means cloud in Hebrew). A great play on words, Israel’s highest restaurant is named after the former UN Secretary General. There, we were treated to steaming bowls of sweet potato soup, salads, tuna and grilled mozzarella sandwiches, bagels, and great cups of hot coffee. 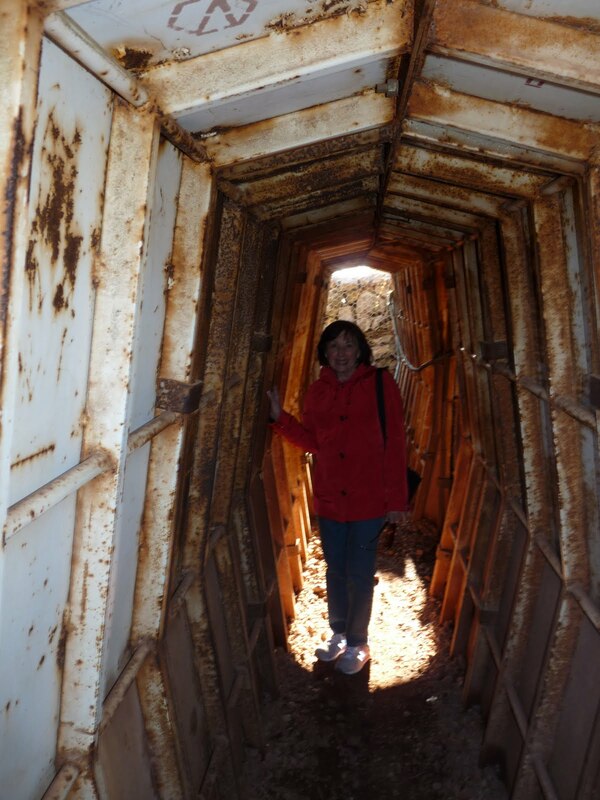 Afterwards, we walked among the bunkers where Israeli troops fought off invading Syrian army during the Yom Kippur War. And right into Syria. Damascus is only 60 kilometers away. “Are you near Syosset? That’s where my girlfriend lives!” exclaimed Sigi with a big grin. “How do you know a girl from Syosset?” We asked. A match made through birthright. My heart melted like chocolate. 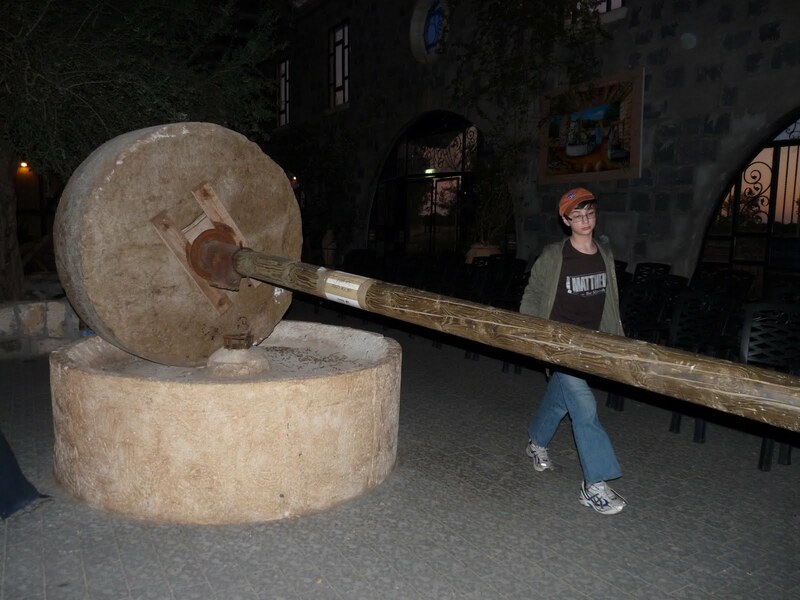 Then, it was onto another winding road to an Olive Oil Factory in the Katzrim village. Israel has no shortage of Olives. Groves of olives are everywhere. As it happens, we were in Israel the very week of Chanukkah, when we celebrate the miracle of the olive oil that burned in the newly restored temple for eight days. It was about the end of this tour that my day started going, well, downhill. 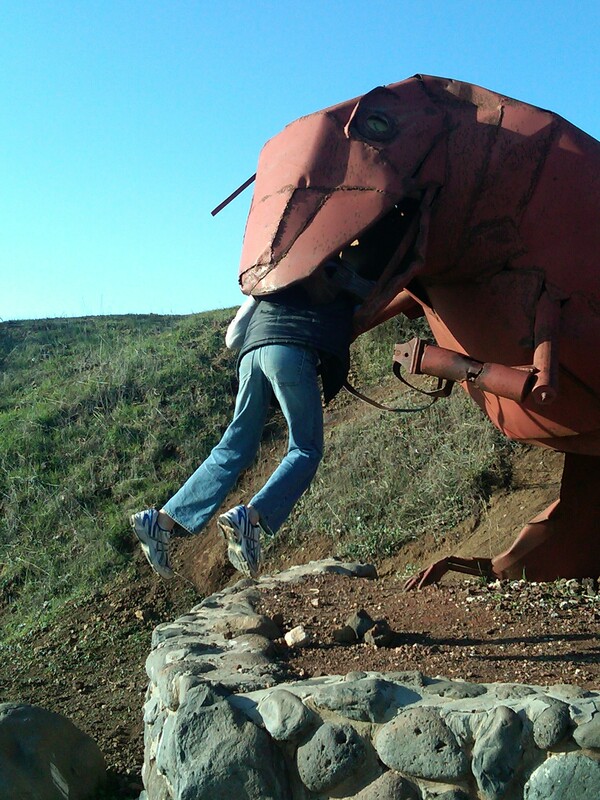 I had already started feeling the effects from a day riding a jeep and riding through the winding hills of the Golan. 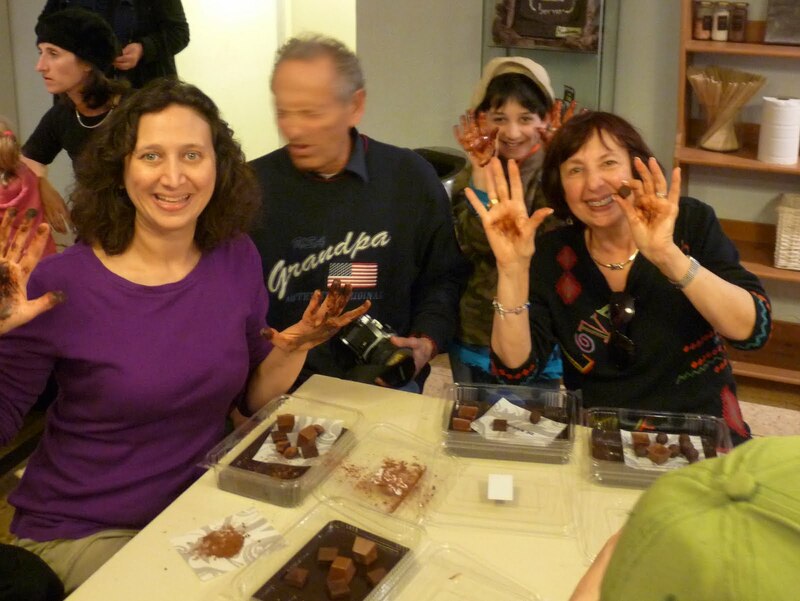 I am sure that chocolate tasting and then olive oil sampling were not much help either. On the winding way back to our hotel on Kibbutz Halavi, I tried to remember tips to ease motion sickness. Look to a still horizon. Don’t talk. Don’t move. Deep breaths. Our driver had to pull over about twice for me. The second time was in the thick of the afternoon traffic rush in Tiberias. I lost sight of the horizon of the Sea of Galilee to the houses and buildings of this ancient and thriving town in Israel’s north. I also lost my lunch, chocolates and olive oil. Our guide Vivi (have I told you yet about the incredible guide Vivi?) hopped off the bus and held back my hair as I puked into the street curb. I was completely humiliated and apologized for making the bus stop so much on account of my weak constitution. 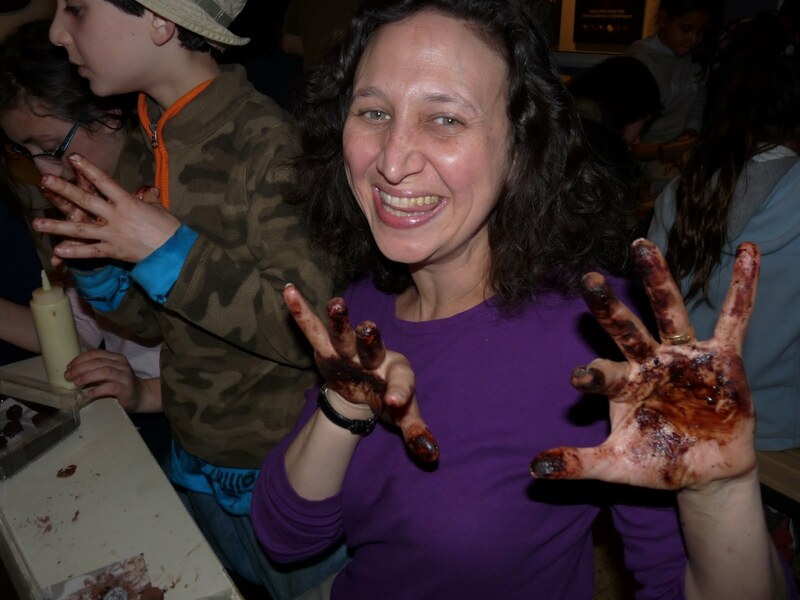 “Aeyn Ba’ayah,” she said, no problem, in Hebrew.”This happens all the time, I’ve seen it all,” she said. Indeed, Vivi has 13 years of experience leading small and large tours through Israel. Out of nowhere, our driver Eli also came to my aid and handed me a freshly-halved lemon. The lemon’s zingy scent was instantly refreshing and reminded me of how an Arab shopkeeper decades ago revived my brother on a hot August day in Jerusalem in 1982 with a lemon. I guess Eli had this lemon stored away for this very occasion. Israeli guides and their drivers are prepared for anything and keep their tourists in very good hands. I spend the rest of the drive sucking on the lemon, rubbing it on my forehead and inhaling its citrus aroma. And I felt much, much better. There is not one big vacation that comes to mind that I didn’t suffer from some kind of motion sickness. I do not do well with motion. When I asked my friends back home who had been on one of these jeep rides in Israel how it was, they described it like being on a roller coaster. I do not do roller coasters. Even stop-and-go traffic makes me ill. 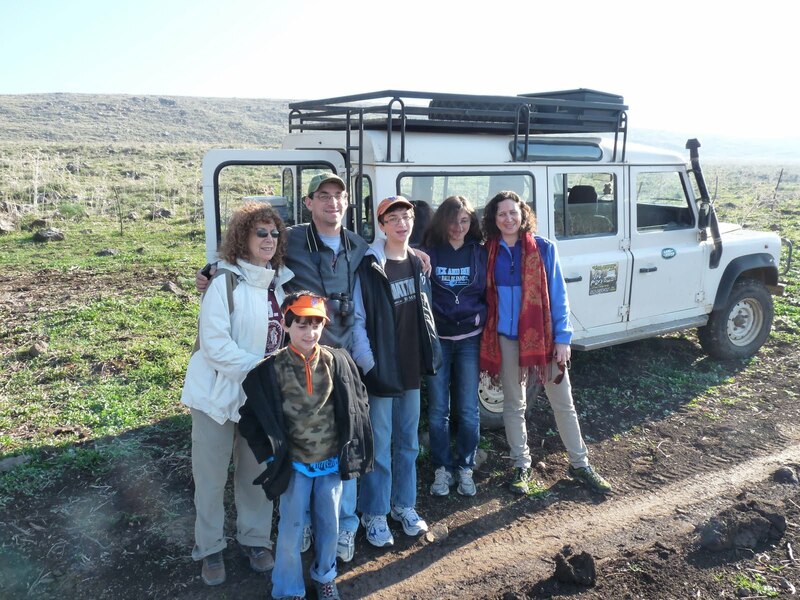 But I am still glad I embarked on a two-hour jeep ride through the Golan Heights. Like anything else in Israel, every tourist activity, even a seemingly carefree jeep ride, is an opportunity to learn and further reinforce the fact that land, water and security are never things taken for granted. The scenery along the ride was beautiful. 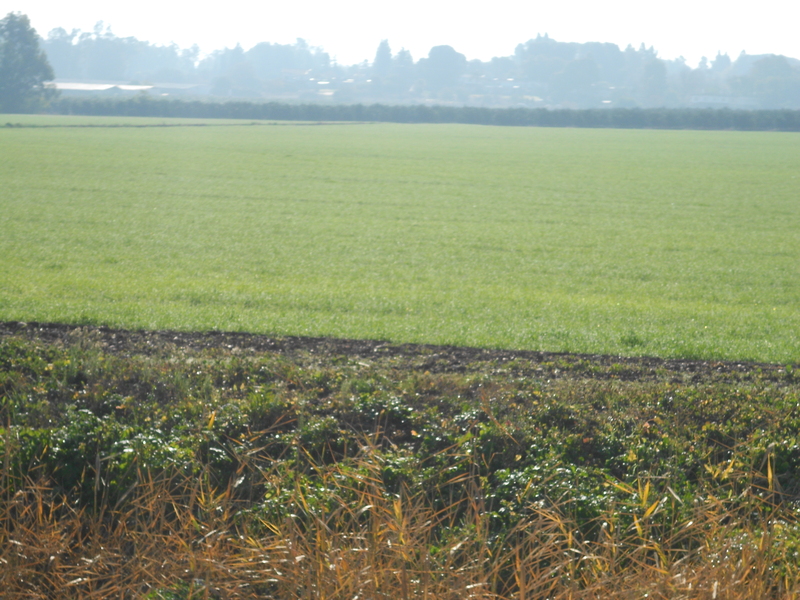 The recent winter rains keep pastures and fields green. Cows graze along the pastures. 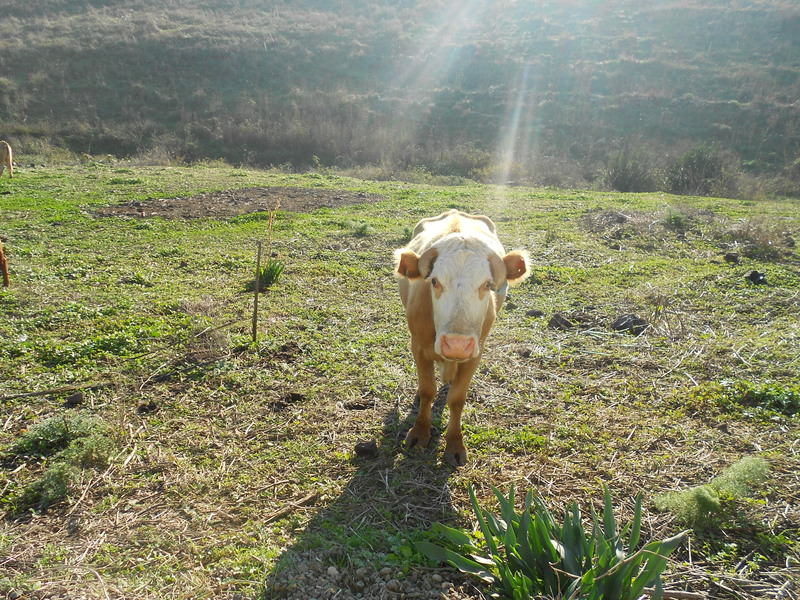 The rainfall in the winter provides grass for the cows, which then provides milk, butter and other dairy products for the Israelis. A view from the Golan Heights looking down into the Hula Valley. The mountains Lebanon is in the distance. But, within that beauty is a constant reminder that it wasn’t too long ago that the people below lived in constant fear when the Syrians controlled the Golan Heights. 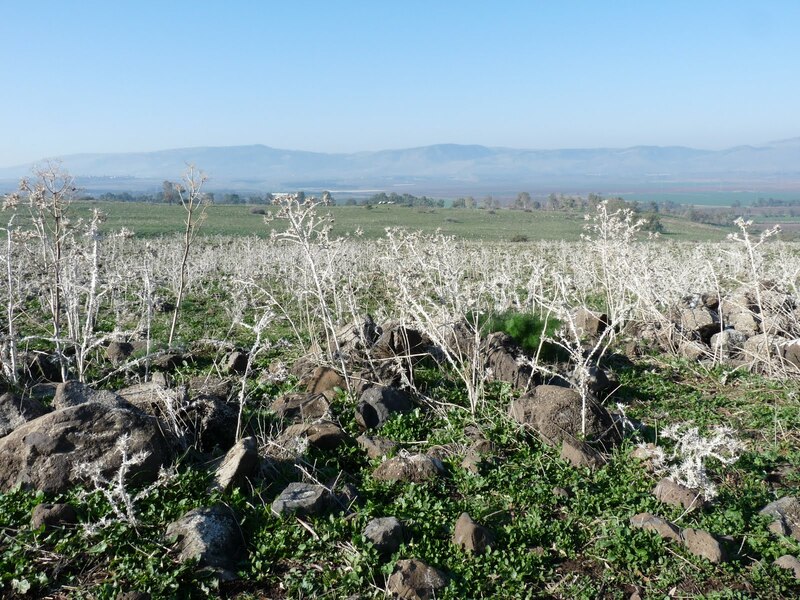 The Golan Heights are high bluffs that were captured by Israel from Syria during the 1967 Six Day War. Fact: Israel is not hungry for more land. They are hungry for safe, defensible borders. So, why then, does Israel not give it back? First of all, what country in the history of the world has ever been put upon to give back land it won in a war? Where are the Golan Heights and why are they strategically important to Israel? If you still don’t understand why the Golan Heights are essential to Israel’s security, I’ll let our jeep driver, Avihu Hardy Yessod-Hamala speak for himself. Avihu is a stout, strong man in his mid-50s with the ruddy complexion of a man who farms for a living. A retired pilot from Israel’s Air Force, Avihu is a fourth generation Israeli. In the early 1900’s, philanthropist Baron Edmond James de Rothschild commissioned Avihu’s great-grandfather to come to Israel because of his expertise as an agriculturist. Once in Israel, he helped pre-state Israel’s first wave pioneers learn how to turn northern swampland into farmland as part of Rothschild’s Jewish Colinization Association. Avihu still lives in the same village in the fertile Hula Valley that his great-grandfather helped found. The region serves as resting point for 500 million birds that migrate each year from Europe to Africa. Avihu’s family grows fruit like peaches, plums, pears and pomegranates that are sold locally in Israel and exported to Europe. Avihu remembers as a child the dangers his villagers faced every day they went into the fields. Syrians had a stronghold and fortresses in the hills we drove along. From that vantage point, the farmers in the fields were like fish in a barrel. Very easy to shoot. 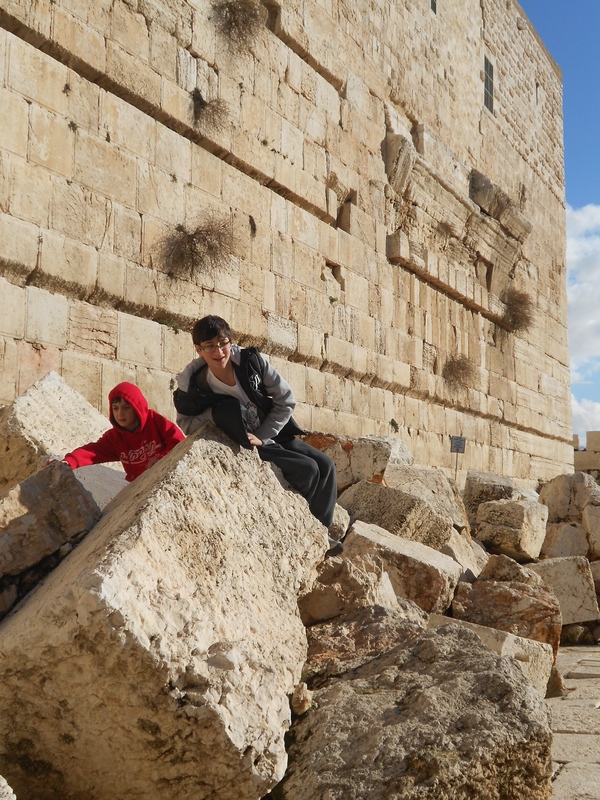 When Avihu was 14, the Six-Day War broke out. 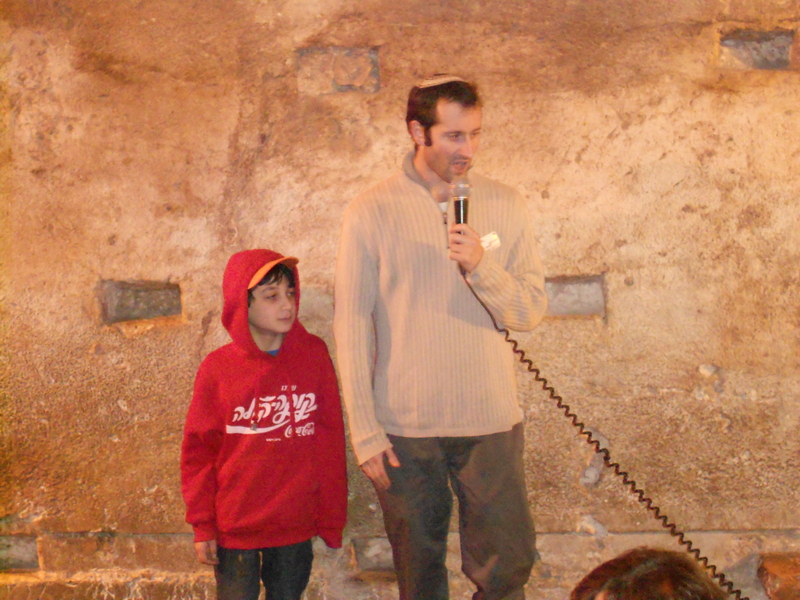 Avihu remembers sleeping in those bunkers mentioned above. He remembers his village being shelled. In some of the fields, there are still active mines though the war ended over 40 years ago. 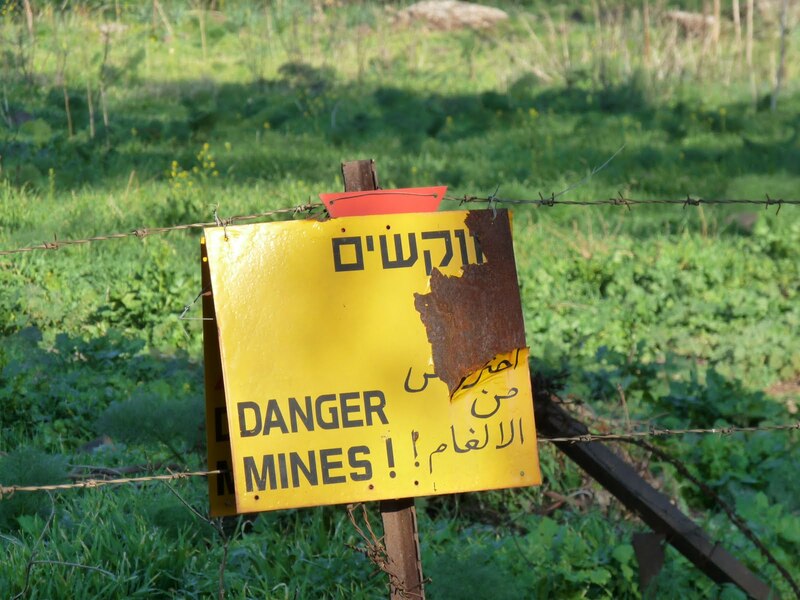 The Syrians refuse to tell Israel where the mines are in these fields, so vast parts of land are wired off with warning signs in Hebrew, English and Arabic. As we took a break sipping freshly prepared mint and honey tea that Avihu made for us in a portable kettle, we could not help but reflect on the beauty – and the still lingering danger – that surrounded us. Just the Facts, Mom! I’m studying for midterms. My daughter came down from her bedroom to talk to me the other night. After all, she is 15. Aside from emerging for meals, school, and showers, she lives in her room. In another astounding development, my brilliant, confident and extremely disciplined daughter came down to ask me – her mom (!) to help her study! She asked me to help her study! She still needs me! Can you name this world leader? This week marks her first set of high school midterms. I admire her extra efforts for studying for them. Math and science is dad’s department. But current events and English, that is my domain. We began to review for her social studies exam. But as we started to review the material – and please – JUST the material – the thought-provoking documentary Race to Nowhere came to mind. As she crammed the names and positions of 40 current world leaders into her head, was she truly gaining an understanding of current world events? I am a news junkie, so I couldn’t help but wonder – she was memorizing names with faces, but was she learning? “Who is this Newt Gingrich and what position of government did he hold in the past? What was he known for doing in this position? I could in some ways empathize with her. The Social Studies midterm was just one test in a slew of tests she will face this week. She still had to conjugate lots of verbs in Spanish for another test. And tackle some tough algebra problems for yet another. Names and faces of world leaders, that’s plenty to know. But is it? “No problem, Ces, Chavez…. he has a mustache! “And why is this a problem? What do these countries both have a lot of that we depend on? But she knows. She knows the leaders of Iran want to wipe Israel off the map. She knows this because it’s what we discuss at home. Just like she knew the leader of Israel was Benjamin Netanyahu before she got that study packet. So, how many world leaders or members of the US cabinet can you recognize or name? And does rattling off these names make our high school students any more knowledgeable on current events? On a final note, my daughter invited a friend home to study and have dinner with us tonight. Another source of midterm stress: the English composition. Acre, or Akko, is an Arab port city in the north of Israel. It is a city that was built and rebuilt by the Crusaders, and then the Ottomans. Parts of the old walled city are being excavated til this day. You can look up the history of Akko. I’m just going to show you some nice pictures that will speak for themselves. In advance of Martin Luther King Jr. Weekend, I bought my eight-year-old son As Good as Anybody, by Richard Michaelson, a beautiful picture book tracing the fight for justice fought by two incredible men: The Reverend Martin Luther King Jr. and Rabbi Abraham Joshua Heschel. The story opened with an angry young Martin growing up in the 1930’s segregated South who was not allowed to swim in a pool or drink from a water fountain or even use a public bathroom because he was black. This was paralleled with a scared young Jewish rabbi in 1930’s Nazi-occupied Poland who could not find a job, use regular transportation, or attend university because he was a Jew. As we cuddled on the couch and read, my son found it most troubling that a person would be asked to give up a seat on a bus because of the color of their skin. I told him about Rosa Parks, the courageous woman who would not give up her seat to white man, and how her refusal started the year-long African-American bus boycott that eventually ended bus segregation in Montgomery, Alabama. 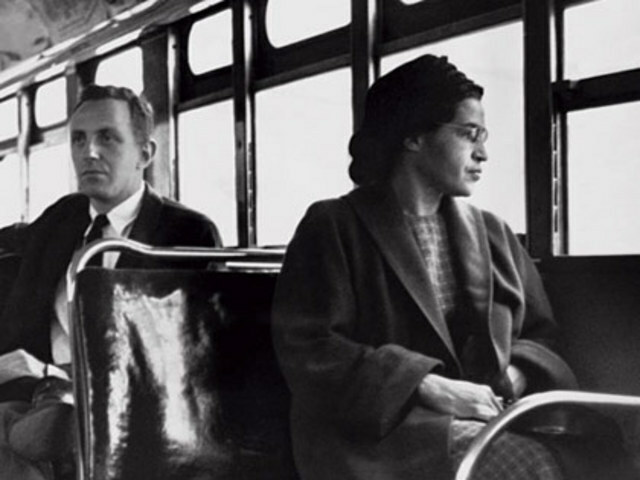 All my life, I have held this lesson that Rosa Parks gave America in the highest regard. But on a plane ride home from Israel, I forgot her lesson. I did not stand my ground. A new kind of segregation is taking hold in certain Israeli towns where small but fanatical groups of ultra-Orthodox Jews are looking to bend and warp Halacha (Jewish law) to their benefit in order to separate Jewish women from public life. All in the name of modesty. I’m ashamed to say that three years ago on that Continental flight bound to the U.S., I gave into the demands of one such fanatical Jew. The plane was full and it took some time for all the passengers to go through the final security check before we finally boarded. It was a midnight flight and, after 10 days of participating in a rigorous Jewish educator program in Israel, I was tired. All I wanted was to settle into my seat (an aisle seat next to a secular man), and sleep for the better part of the 12 hour flight. My husband and kids were waiting for me on the other side. Then, a steward came by. Standing next to him was a man dressed in 18th Century garb: white shirt, black coat, black knickers. The man sternly looked at me and let the steward do his asking. Outside of asking me for this favor, or money for tzedakah (charity), he would not regard me as a fellow Jew. The religious reason is that this man was following this perversion of modesty codes that are stretching beyond houses of worship and are impacting every aspect of public life in parts of Israel. Women are beginning to be segregated on sidewalks. At funerals. On busses. And yes, they even want to extend their restrictions onto airplanes. Heaven forbid a man should sit next to a fully dressed woman and accidentally rub elbows. I was told in advance by our group leader not to give in to these demands. But, in the heat of the moment, I caved. So I moved. I wound up sitting in a middle seat. In the row right in front of the bathroom so my seat wouldn’t recline all the way. Because a man wanted my seat so he could sit next to another man. At the end of the flight, sheepishly, the man thanked me for giving up my seat. At that point, I took a lesson from Dr. King, and Rabbi Heschel. 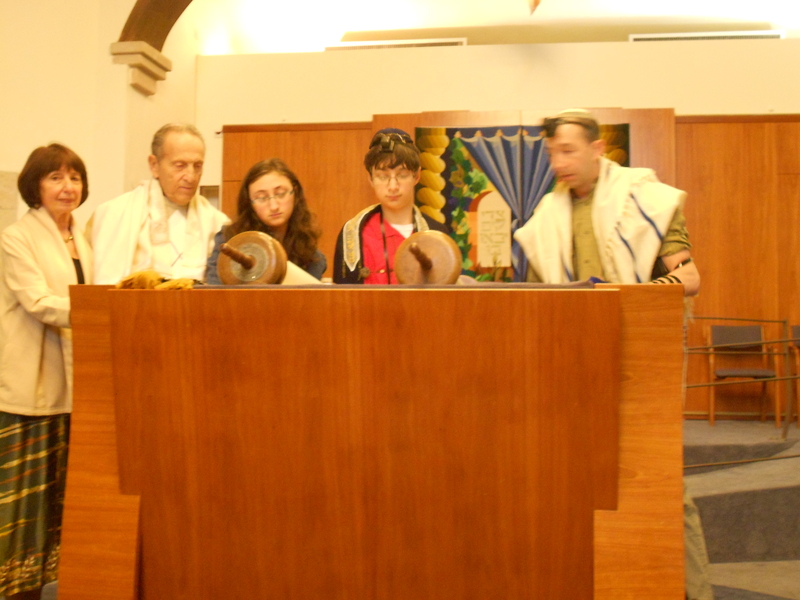 I told him, if he wants to practice what he learns in the Torah, he had to live in the world. After years of waiting, finally I got to take a tour of the passageways below the Western retaining Wall of the Temple Mount, Jerusalem. In 1967, when Israel reunified Jerusalem after capturing the Old City from the Jordanians, the Jewish Quarter of the Old city lay in ruins. For nineteen years, Jews had been kept away from their holiest site from the Jordanians. Jordan had destroyed most of the synagogues in the Jewish Quarter. Most of the Western Wall, the remnant of the Holy Temple that stood two thousand years ago and was destroyed in 70 AD, was buried in rubbish. 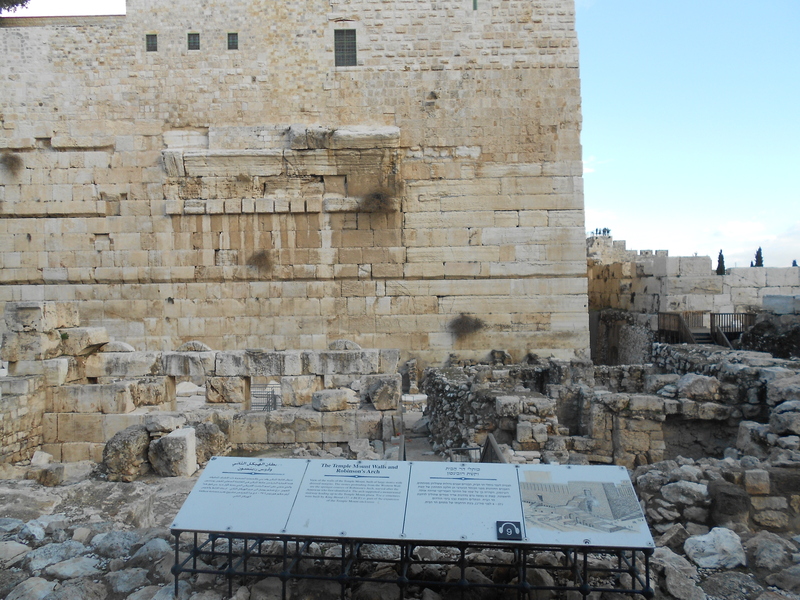 When Israel recaptured the Old City from Jordanian rule, Israeli authorities pledged that they would restore the Old city and do extensive renovations along the Western Wall, and then continue these restorations to the Southern Wall of the Temple Mount. 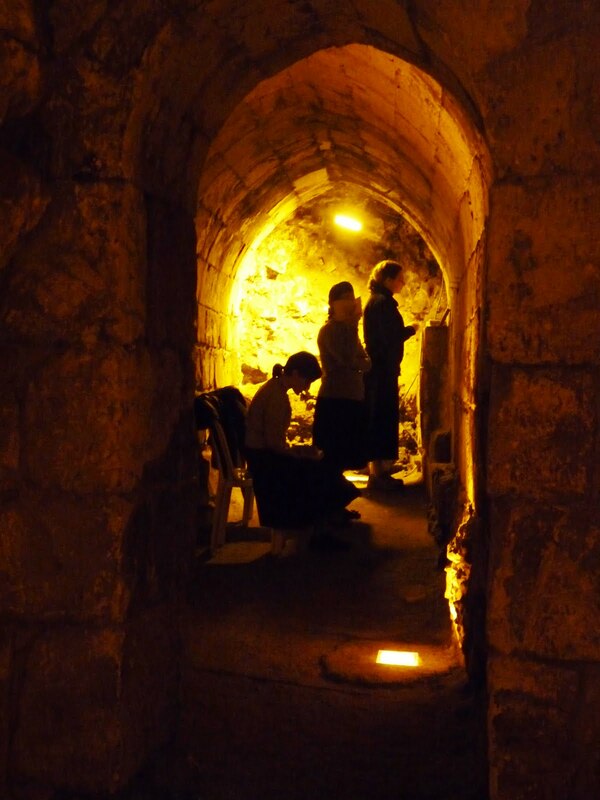 After decades of painstaking excavations, the tunnels were opened to the public in 2002. For complete details on the history of these excavations, click here. 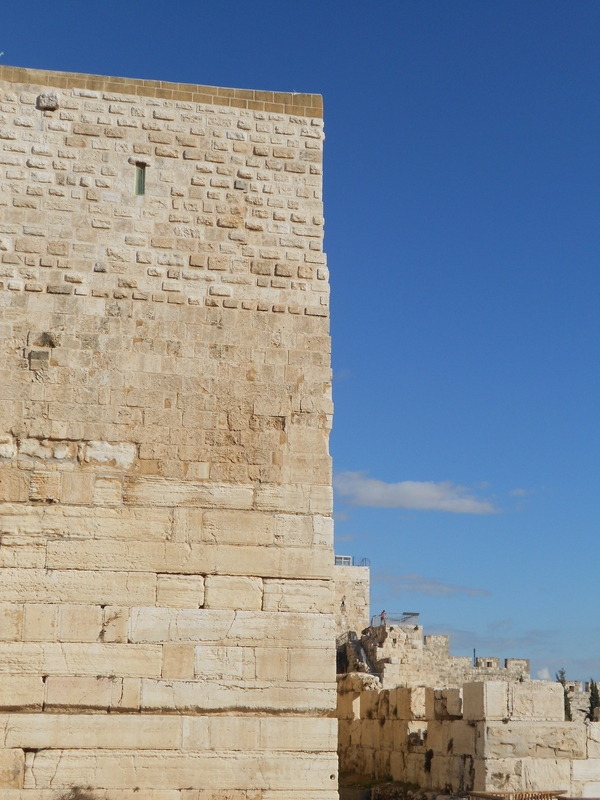 Actually, this is only a small portion of the enormous Western Wall that King Herod (truly the Donald Trump of his day) had constructed as a retaining wall to expand the Temple Mount to support the Second Temple. Today, this massive wall is buried and where over the centuries, the Moslem Quarter of the Old City was built over the rubble. Below the surface, there are narrow passageways, but there are also cavernous rooms. 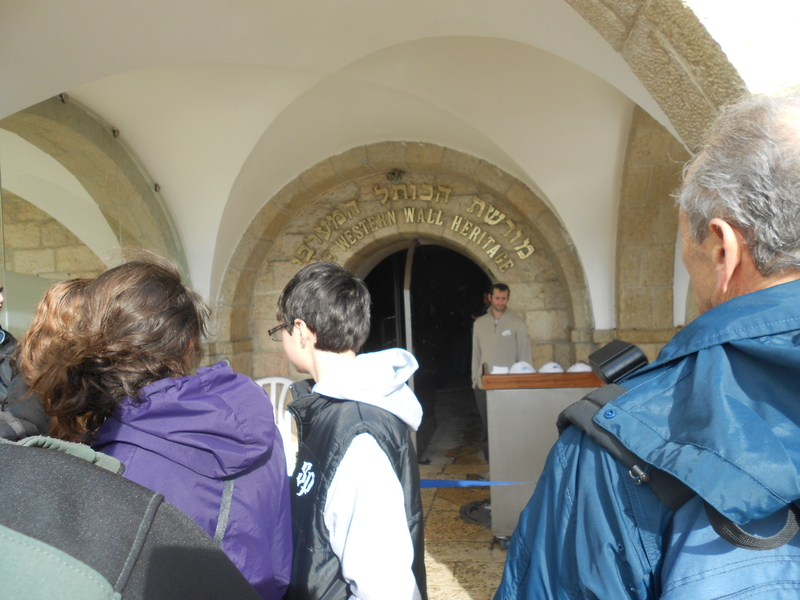 The visitor is taken back to the First Century, the heyday of Jerusalem at the time of the Second Temple. and construction workers. In the distance, down a tunnel not yet open to the public, there are the noises of hammers and drills as further excavations are meticulously conducted as to not disturb the houses in the Moslem Quarter overhead. There are new discoveries made every day. Down here, even construction work is holy.